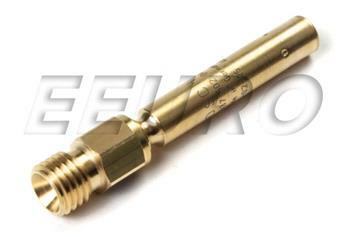 K- Jetronic (CIS) fuel injector. Should be replaced in complete sets as all injectors are in parallel at the fuel distributor. Replace injector holders and upper seals with injectors. A fuel injector is actually a combination of a nozzle and valve that controls the delivery of fuel into the combustion chamber of an engine. 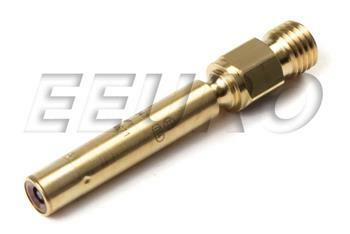 The nozzle is carefully designed to atomize fuel in a very fine spray to achieve a homogenous mixture of air and fuel. A failing or clogged injector can cause incomplete burn and/or a dangerous lean condition in a cylinder. This can present itself as a misfire, hesitation, stumbling, or low power. Leaking fuel injectors can have symptoms such as hard starting, poor emissions, increased fuel consumption, damaged catalytic converters, and increase fuel odor in and around the car. Some success can be had with fuel injector cleaner but it is critical to an engine's performance and life that properly functioning fuel injectors be used at all times. If this is not the exact Fuel Injector you are looking for, or you would like this part in a brand other than Bosch, please contact us and one of our customer service experts will help you locate the exact part you need. eEuroparts.com® proudly offers wholesale prices and fast shipping available on most orders. We also provide inexpensive and guaranteed 3 day, 2 day, and Overnight shipping options, so if you need your Fuel Injector tomorrow, eEuroparts.com® can deliver! Every eEuroparts.com® order is track-able, meaning you'll know exactly where your Fuel Injector is at every step of the shipping process. eEuroparts.com® also displays your Expected Ship Date and transit time in your Cart, making our entire shipping process simple and transparent.